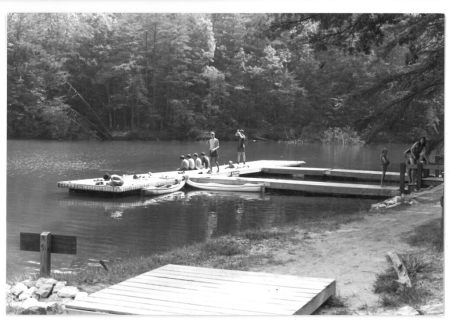 Lake James was a milestone in state park development -- the first state park to be created with appropriation of state funds for both land acquisition and park development at the time the park was acquired. Prior to this time, parks were established in land only or, in some cases, by land that had already been developed with facilities by federal projects such as New Deal Era Recreational Demonstration Areas, by Works Progress Administration and Civilian Conservation Corps projects, or by previous owners. Lake James was created by the Duke Power Company between 1916 and 1923 by impoundment through damming of the Cawtawba River, Paddy Creek and the Linville River for hydropower. And it was named for the company's founder, James B. Duke. Portions of undeveloped land around the park were used for timber, and logging roads developed for these activities have remained. Today they are used for hiking, horseback riding, and park management. The park began with an initial 565 acres on the southern rim of the lake. The park's facilities were developed over about 60 developable areas in the initial tract, with the rest of the land largely unsuitable for facility development. Acquisition of additional land in 2006 came about through citizen and conservation organization advocacy and partnership with state and federal agencies. The process began in the late 1990s with concern over the environmental impact of impending development along portions of the shoreline. The group "Citizens to Save Lake James" gathered support and with the help of the Foothills Conservancy, headquartered in Morganton, worked with state, local and federal agencies to secure approval for public purchase of park land. In 2006, an additional 2,915 acres were purchased from Crescent Resources, a land management company in Charlotte, at a cost of more than $18,000,000. The appropriation included funding from the Clean Water Trust Fund Act and funding for park facilties was included in the appropriation. The additional park land is located primarily on the northern rim of the lake, near the Linville Gorge National Wilderness Area. North Carolina Division of Parks and Recreation. Lake James State Park. http://www.ncparks.gov/lake-james-state-park (accessed September 19, 2015). North Carolina Division of Parks and Recreation. Annual Report of the North Carolina Division of Parks and Recreation. 2015. http://digital.ncdcr.gov/cdm/compoundobject/collection/p249901coll22/id/... (accessed September 19, 2015). North Carolina Division of Parks and Recreation. Lake James State Park Master Plan. 2006. https://archive.org/stream/lakejamesstatepa00unse#page/9/mode/1up/search... (accessed January 10, 2016). [Associated with William D. Kinyiah, Spencer, N.C., Lake James, N.C.] Photograph. ca. 1920-1930. Item H.19XX.321.24, North Carolina Museum of History. http://ncmuseumofhistory.org/Collections/Search-the-Collections (accessed January 10, 2016). [Swimmers at dock on Catawba River, Lake James State Park]. Photograph. ca. 1990. North Carolina State Parks. Great article! Was very helpful when writing about the lake for an essay! This is soooooooooooooo helpful! Thank you for putting this up! I found this very helpful!